Every Door Direct Mail is rated 5.0 out of 5 by 14. Rated 5 out of 5 by ScottyBlue7 from This was an excellent choice for me!! After working with another online printer who made it so difficult to accept my design, who by the way, sent it back to me 3 times to make revisions, I had no other choice but to look for a printer that was easy to work with. You made it so easy and simple for me to accept my design, print it out, plus get my postcards back to me in a timely manner! The Postcards turned out Great!!! I have already recommended your services to other real estate agents in my office!! You have a lot more of my business coming your way! Rated 5 out of 5 by MWBC from Every Door Direct Mail Postcard We ordered postcards to send out to our community to let them know about our additional church service on Sunday morning. The postcards looked great! We were pleased with our order and your service. Rated 5 out of 5 by Squeegee Squad from Fast and Affordable I had this 6.5x9 card designed on Fiverr for $29 and simply uploaded to 48 Hr Print and received my order a few days later. This EDDM will easily make me $30,000. 48 Hr Print made it very easy and affordable. I'll be using them again! Rated 5 out of 5 by Tata from great fast services at a good price, and the prints just want I wanted. Every Door Direct Mail® is a direct mail service by the USPS that provides marketers and small business owners a cost-effective means of connecting with specific neighborhoods using their own custom EDDM® postcards, with no mailing list required. Using EDDM® routes from the USPS, you can target local neighborhoods based on demographics like average age, income, or household size that fit your target market. 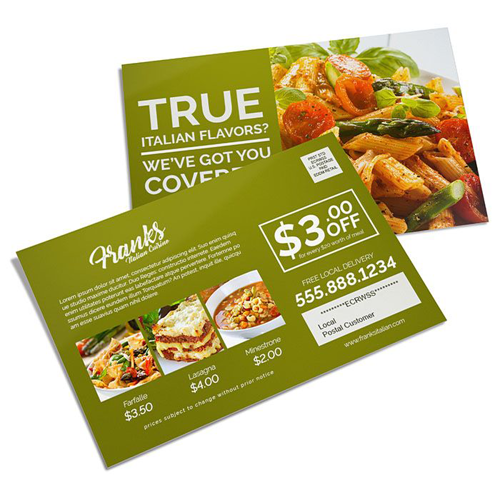 You can saturate entire zip codes and EDDM® routes with your promotional postcards without spending a lot of money. For postage, you can also choose between ready-to-use EDDM® retail indicia or specify your own custom indicia on your artwork. If you need your cards right away, you can also choose our 1-day print turnaround time and have your EDDM® postcards ready to ship in a day. Our EDDM® printing services also include free file templates and free file checks to make sure your direct mail postcards are EDDM®-ready. We also offer a powerful yet easy-to-use online design tool that makes creating custom EDDM® postcards a snap. We can also bundle and shrink-wrap your postcards to the required batches of 100 pieces (with slip-sheet separation)—ready for post office drop-off.